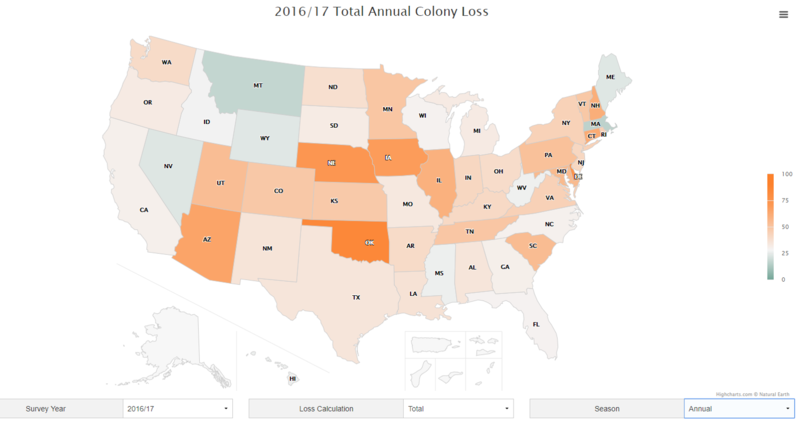 The viz shows the annual loss of bee colonies in the United States in %. No context is provided. The purpose of this viz is to raise awareness of the bee loss in the United. However, no element of storytelling is used to amplify this message. It is not mentioned in the legend or the title that the numbers in the viz are in percentage. The color palette is not intuitive. The diverging color-palette is reaching from 0% (dark green) to 100% (dark orange). I would associate a dark green color with a positive increase, however here it is not the case – it is equivalent to 0%. In my view, it would be more intuitive to color values close to 0% in white. Therefore, a sequential color palette starting with white and then increasing step by step to a darker orange or red would make the most sense. In an overwhelming amount of states in the US, bee colonies are decreasing. I created a tile map. The respective graphs for the states are arranged in a way that depicts the map of the US. With the dual-axis I created an area chart combined with a line chart. The area chart shows the decrease or increase of bee colonies over time. The line chart with the respective data points for each year makes it easier to identify the data points for each year. I created a set which checks if the bee colonies have increased or decreased since 2013/2014. The states are colored by the condition of this set (red = decrease, yellow =increase). In the title, the number of states with a decrease and the number of states with an increase of bee colonies are called out in big numbers and color-coded by the condition of the set. A click on the numbers will highlight all the states belonging to the respective category (increase or decrease).